Im going to have to look back to past talks to make sure but Im pretty sure we discussed the tidal species at somepoint during something that made me believe species caught in tidal were to be considered saltwater. I'll see if I can dig it up. Re: Tidal water Entries. How do I Decide? Here is the precedent on the west coast. But I was pretty sure there was a discussion already about the Hammond River and the Oromocto. If a striper is caught in tidal it should be salt, but if caught in fresh, say Grand Lake it should be in the fresh. This discussion should be moved Jeff, we've slightly hijacked Ryans post haha. Why is a striper any different than a Cutthroat trout? Or a steelhead? Or a White Sturgeon? I figured that since you are fishing under a saltwater license and regulations that it would carry over to this. Part of the rules of the event say that in order for your species to be eligible it must be caught according to local regulations. I remember the striper talk now. The only problem we face with species specific is that it becomes a nightmare to track. If someone is fishing near a tidal boundry area they are usually pretty aware of the change and the imaginary line that separates fresh and salt. Often in areas like Vancouver certain species are protected when they are in fresh water and off limits. Same goes for the great lakes. I don't think its a problem as most people are honest and will tell you honestly where they caught the fish, there aren't that many fish that can tolerate both fresh and salt. I'm fine with a fish caught in freshwater being labeled a fresh water species and the same with saltwater. Just remember, we have yellow perch that live in the saltwater of Richibucto (they just have no yellow in them). There are a lot of species that fall in this grey area. All kinds of trout species and many others. Whatever you guys want we will do. Does this line of tidal boundaries and fish entering make sense? If so then I can draft a new rule to be stuck in there. Please pipe up if you do not like this. There's no grey area when the DFO stops to talk to you. There is a definite regulation boundary between the salt and fresh on the Fraser for example and I guarantee they won't let you use your freshwater licence 1 foot downstream from it. I personally think that it would be a big mistake to categorize spp as either fresh or salt. Too many migrate through to spawn and feed. Catching the same species in fresh and salt can be very different challenges. 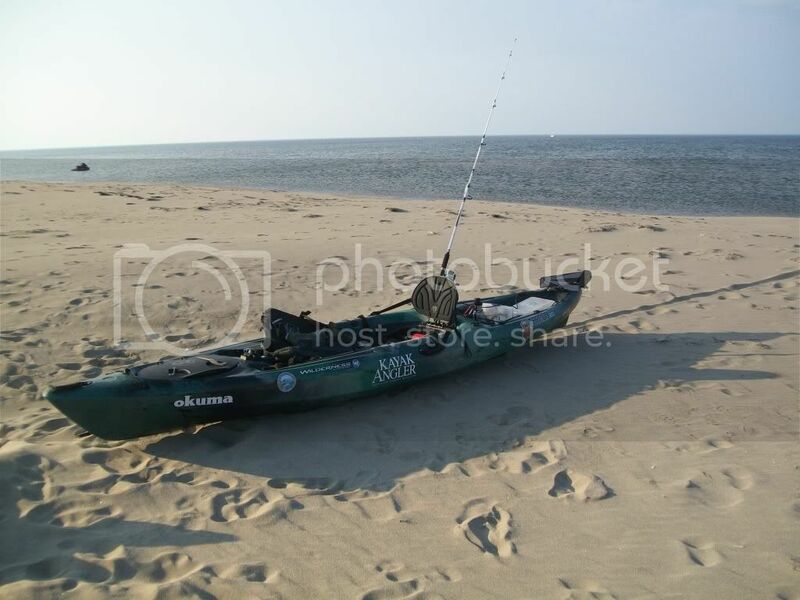 A fresh freight-train chinook in the ocean out of a kayak while dealing with tides and waves is a way bigger accomplishment than catching a tired old boot way up river. If a saltwater angler paddles the x kilometers to mooch or driftfish where the salmon are holding 70ft down, manages to hook and land, and then get himswelf safely back to shore only to have an interior boy get the same points after dragging a half dead one to shore only 30 meters away then holy crap what's the point lol! Unfortunately there is grey area here in New Brunswick. We have hundreds of miles of rivers, and thousands of acres of lakes that are in tidal water, yet they are freshwater. Jeff, you and Paul were here last fall and you could tell how fresh the water was, yet that was tidal. In Fredericton I am 100km upriver on the St.John and it is considered tidal water where I am. If we declare that every fish caught in tidal water counts as a saltwater species then every fish caught at the NB Paddler's Fishing Derby will have to be considered a saltwater fish. Yellow perch, white perch, pumpkinseed, fallfish, smallmouth bass, chain pickerel, brown bullhead, eel and shad. I also hope that sometime this year one of us will catch a saltwater muskie. IMO, if you catch it in fresh water (or mostly fresh water), it should be considered a freshwater fish for AOTY. If it is caught in saltwater (or mostly saltwater) it should be considered a saltwater fish for AOTY. In many places the tidal boundaries probably will work perfectly fine for these boundaries. In New Brunswick, the unique situation with the Bay of Fundy tides, and the St. John river funneling through a small channel called the reversing falls, this doesn't work. Remember we are working on a fun competition here, not trying to scientifically categorize them. All of the miles of shoreline on both coasts have tidal waters Bob and they are all clearly defined in regulations. Some are more than others in that some have signs and some have km advisories. They then become one way or another under different regulatory rules. There is nothing special about the bay of fundy. Big tides or little tides the tidal boundries separate the regulations. This helps us to define things pretty clear salt/fresh. There is no better definable solution for it. Is there? Catching the same species in fresh and salt can be very different challenges. True Wayne. There is a complete difference in tactics with many species when fishing the fresh to salt. Behaviors of the fish change completely depending on the species. And another thing to consider is that there really isnt an advantage for one coast or the other when it comes to the amount of available Marine and anadromous species. East coast doesnt have the number of trout and salmon species that run the rivers but they have these pikeral and bass and things. I also was wondering this same thing... earlier Jeff I am pretty sure you told me that fish caught in tidal were to be considered salt... but I really dont care either way... the fish in the east region of late posted by some are indeed from tidal waters but are also generally considered freshwater fish.... need some way of seperation here thats for sure. For sure Bob, it's important to not go overboard when there hasn't really been a problem so far. It's pretty easy to determine most fish that are generally considered freshwater only (potamodromous). If someone catches a pickeral in an area of a river that is considered tidal because it's influenced by the change in water level but the water is always fresh then I hope it doesn't get entered as a saltwater entry. A coho caught in the one of the great lakes is a saltwater species but is in fresh water... it has been a freshwater point and I don't think it has raised any questions. It would seem weird if someone entered it as a saltwater entry. Within the tidal portion of the Fraser there is going to be parts that are fresh as well so I see your point NSYak. There is a difference between areas influenced by tides and those that are brackish and then those that are salt. I guess if you're going to make a saltwater entry, make sure it's obvious.